One of my biggest highlights on the “church side” of things was when The Zurisidai Church in San Jacinto finished the ENLACE training process to become what we call a “Leader Church.” The church had embodied a new vision of itself, learned how to connect with its community, had designed, run and managed a series of projects and finally had become an effective leader in community transformation. 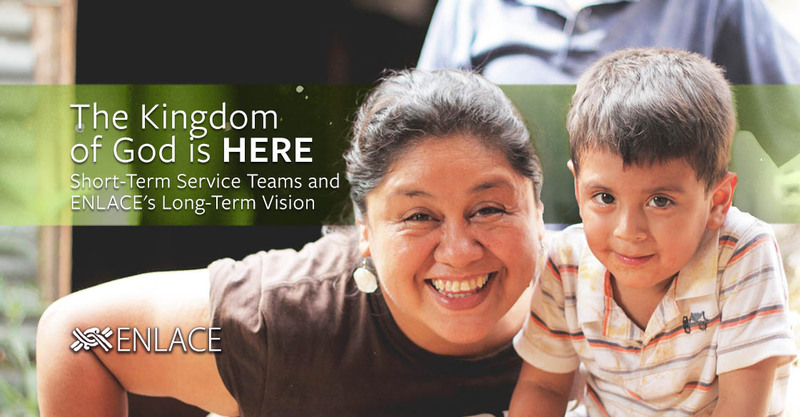 I was overjoyed and thought to myself, “It’s working!” The ENLACE model truly helps to lead a church out from its four walls and into its community. In a similar way, I see this same broadening of vision when I work with teams. Over the last ten years, I have had the huge privilege to meet and become friends with people all over the United States and Canada. In the process, I’ve learned that every service project is much more than bricks and mortar, sweat and toil. Projects, such as latrines, eco-stoves, retaining walls, and new homes, all address ENLACE’s extremely important eight core outcomes, but also are opportunities to create intersections where friendships are forged and relationships strengthened. More often than not service team members walk away with an incredible experience that has forever changed them. They return to their homes understanding the “why” of ENLACE and they come away knowing that the local church pastor and leaders working with their neighbors are the real heroes. But on the other side of the coin, I have seen church and community members so touched and impacted when they experience North Americans who come and work so hard for their well-being. 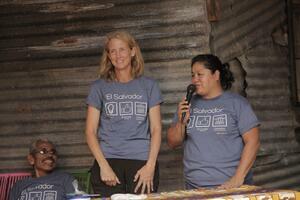 My fellow Salvadorans return to their homes changed, too. The ripple effect continues on to the mayor’s office, community associations and boards, and even to our ENLACE staff. Even I have been changed. When we choose to overcome the fear of crossing barriers that divide us (not just religious and social, but also our own disbelief in ourselves and others) and listen, we discover and see the reality of how people live and the nature of their struggles. It is then that we can participate in God’s action. We can be his hands and feet. And the moment in which needs are met (physical and spiritual), we experience a different world– a totally different reality in which the lowly become lifted up. We also learn that we are “the lowly;” We are all “needy” in different ways. And that’s the beauty of God’s Kingdom– no one has to be a stranger, everyone is invited to the party. I saw this most clearly when I worked on a school project in which a service team came from a U.S. business called John Houston Homes. This group was helping the Dios de la Profecía Church, located in Potosí, El Salvador to build a perimeter retaining wall around the school. The day was hot and rainy, and the project foreman was very worried about the stamina of the team members. He warned the ENLACE staff not to let them work too hard for fear that they would become sick with dehydration or exhaustion. The team was cautioned and yet worked incredibly hard all day and into the afternoon. So hard, in fact, that the foreman told me later how impressed he was. Not only did they dig and stack and build, but they joyfully included children in their efforts so that by the end of the day, children and adults (U.S. team members and Salvadorans) had created a party-like atmosphere full of laughter and fun. Women started making pupusas and horchata was passed around like water. It was then that I saw something so incredible. There was old tile flooring that had been removed to make way for new construction. Instead of the tile being thrown out, a group of masons and volunteers had repurposed it as a decorative element on the school wall. They stacked it in such a fascinating way; I had never seen something like it. It was beautiful. That day, as on so many days since and in so many different communities, I saw how “useless debris” could become incorporated into something beautiful. Whether we knew it or not, all of us together– by loving each other through service– we were creating a space in which incredible things were being born. That same creativity expressed through floor tile was also expressing itself through our radical reinvention of our relationships with one another. The lowly were being lifted up and we all found ourselves in the midst of God’s care.